Team Scotland have unveiled a bizarre line of kitwear for the upcoming Commonwealth Games in Glasgow. Athletes were handed their new kit at the team's official meeting in Stirling, with over 400 athletes and officials in attendance. It will see Team Scotland wear a bright mixture of colours during the opening ceremony, with its turquoise, fuchsia and navy blue set on a burnt caramel background produced by House of Edgar at the Isle Mill in Keith, Aberdeenshire. 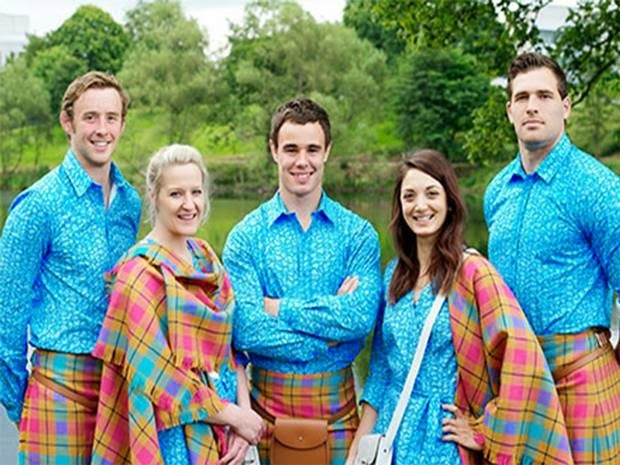 Designed by textile guru Jill Blackwood, she says there will be "no mistakening Team Scotland" members with their new uniform. The Scottish public were clearly bemused at the new design, regarding it as something of an embarrassment, and took to Twitter to register their views. In spite of the questionable colour choices, it appears to have gone down well with Scottish athletes, with Rugby 7s player Scott Lee describing it as "eye-catching". The Games begin on 23 July and the 10-day event finishes on 3 August.